Antique Brass Executive Desk Gimbal Compass 8"
Solid Brass Edgar Allan Poe Poem Compass 4"
Solid Brass Admirals Sundial Compass w/ Rosewood Box 4"
Solid Brass Black Desk Compass w/ Rosewood Box 3"
Solid Brass Captains Push Button Compass 3"
Solid Brass Scouts Push Button Compass 2"
Solid Brass Hanging Compass 8"
Solid Brass Lensatic Compass 3"
Solid Brass Clinometer Compass Paperweight 3"
Solid Brass Captains Desk Compass w/ Rosewood Box 4"
Solid Brass Admirals Black Faced Compass 4"
This Antique Brass Executive Gimble Compass 8" is a solid brass reproduction of an antique sailing ship cabin compass. The compass is mounted on a 360-degree double-gimbaled ring system on a heavy wooded base. The gimbal ring design allows the compass to remain level regardless of the angle of the base. The base is wood so it can rest sturdy on any desk. 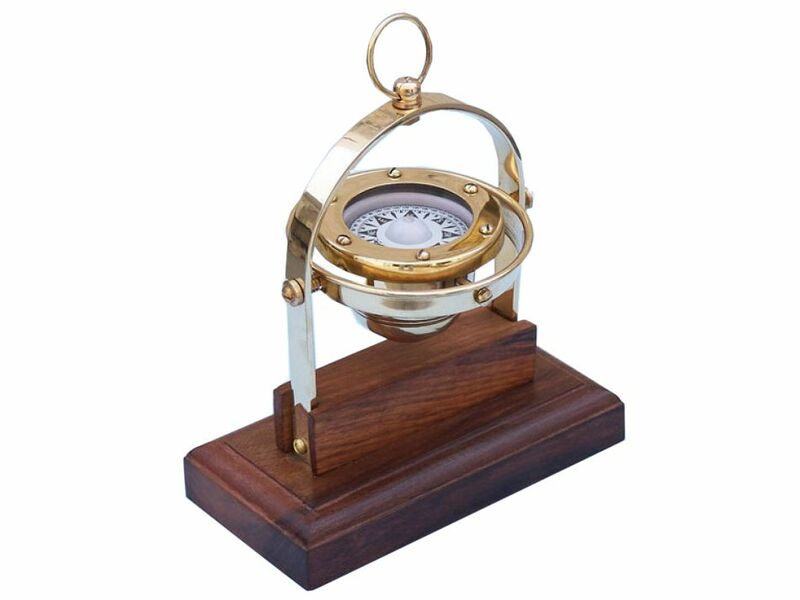 Give one of these stunning marine compasses for sale as a gift to the nautical history fanatic in your life. Perfect for someone who has delved into the fascinating history of life at sea, this antique marine compass displays two of the most important innovations in sailing and navigation. First designed around 200 BC, the gimbal became a necessary application for many tools aboard ship, compensating for the pitch, roll, and yaw of the vessel by keeping various equipment and stores upright. Invented a thousand years prior, the mariners compass came to dominate sea faring, especially during the European Age of Discovery. This marine compass for sale demonstrates the amazing ingenuity involved in its creation, as well as displaying the intrinsic beauty in the elegant simplicity of such a device. 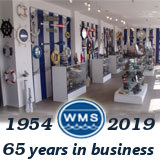 For someone who truly understands the historic relevance and implications of the gimbal and compass, this marine compass for sale is truly a wonderful gift.